Hotel Campanile Hotel and Restaurant. The meeting room is 7m x 5m with an option to rent another room. Tea and Coffee will be provided, all day to the room. The hotel has lots of parking so delegates will have no problem arriving by car. The photo shows only a small part of the parking. 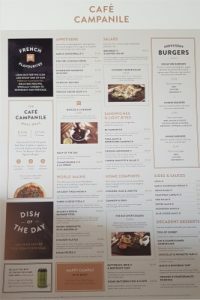 Campanile has a great restaurant and Cafe bar inside the premises, plus a bar. This means we can have our normal TI meal without leaving the premises. The following pictures show the restaurant and bar. The hotel has 93 rooms, a selection of double rooms, Twin rooms, and 4 accessible rooms. There are NO single rooms. It also has interconnecting room’s ideal for families available upon request. Guest can enjoy full usage of Bedroom Amenities including Flat Screen LED Free View TV, Complimentary Tea & Coffee Tray. Hair Dryer, Direct Dial Telephone, paying Wireless Internet Access(WI-FI), Work Desk, Wake Up Calls, Shower/Bath, Blackout Curtains, Baby Travel Cot available upon request. The hotel offers 4 accessible rooms all equipped with a personal pull cord alarm in the bathroom & bedside which sounds in the reception area. 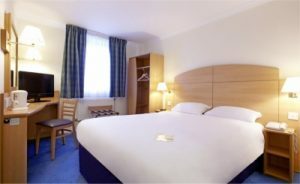 Our accessible rooms are generously sized for wheelchair access and have a large open walk in shower with anti slip flooring and safety handles on the walls. From 6:30 am to 9:30 am (and from 7am to 11am on Saturdays-Sundays & Public holidays) all-you-can-eat Continental buffet : fresh fruits, yoghurts, cereals, pastries, cheese, ham, fruit juices and a selection of teas and coffees; in addition to traditional cooked breakfast. Our informal dining area has something for everyone. If you’re looking for somewhere to get good-value food, join us for one of our fantastic food offers. Fancy a bite? The Daily Menu offers you everyday choices for great value! Check out our daily menu for the offers available. All our dishes are available from 12.00pm till 9.45pm unless otherwise stated. There is a large Bus Station nearby at Saint Margret’s Bus Station. Buses connect to East Midlands Air Port by the Sky Link Service, which runs on a regular basis. The city of Leicester has a main rail link to both north and south. This is easily connected to other main north or south air ports.